Evgeny Morozov is perhaps the most skilled contemporary practitioner of the rhetoric of contempt. Â He seeks to win arguments (and attention) by treating ideas he dislikes with scorn and ridicule and by treating their proponents with mockery and cruelty. Â He encourages this behavior in others. Â The exchange below, which happened earlier today, is a good example. When I first met Evgeny in 2008 he was a journalist, working for The Economist. Â He was smart and entertaining. The mean-spirited Â persona only came later. Â He honed it on his (now abandoned) Foreign Policy blog, Net Effect, and then parlayed that persona and style of argument in a very successful and misleading book, The Net Delusion. Â That book was published just as the Arab Spring was getting started. Â It soon became clear that his argument – that those who are optimistic about the liberating power of the Internet are deluded – was simply untrue. So he has turned his gaze to Silicon Valley and has started attacking Tim O’Reilly and Jimmy Wales instead of the State Department. Yet he has maintained the rhetoric of contempt, inserting vitriol into important discussions, misleading the unsophisticated, and muddying the waters of real intellectual inquiry with ad hominem attack and straw man arguments. I have not asked Evgeny about his rhetorical strategy, but I would bet that it is strategic. Â I think Evgeny enjoys being contemptuous, but he is also smart enough to realize that it works. 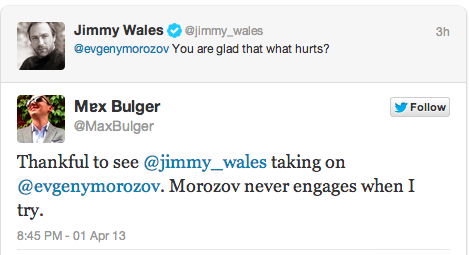 Â The tweet at left, from Max Bulger, a student at Tufts University, is illuminating. Â Evgeny won’t talk to a student about his ideas, but he will bait the big fish like Jimmy Wales and Tim O’Reilly on Twitter to increase his own name recognition. Â Evgeny has 36 thousand followers. Â Jimmy Wales has nearly 82 thousand. Â Tim O’Reilly has 1.7 million. Â You do the math. Â I bet Evgeny has. So, this post is not a plea to Evgeny to stop using the rhetoric of contempt. Â It works well for him, so he has no reason to stop. Â It is rather a suggestion to others not to fall into his trap by responding or (worse yet) responding in kind, as Jimmy Wales did. Â Don’t feed the (intellectual) troll. it is really something to accuse Morozov of bad faith because he has a nominal profit interest in his own success (as everyone does), but then fail to apply that analysis to those he criticizes. His whole point is that a giant industry has developed that continually sells us things that it claims are for our own good, but actually aren’t, and that treats US with a huge amount of contempt. I see contempt oozing off the pages of those Morozov attacks, with their talk of “incumbent industries” and “reality is broken” and so much else: they love so little of our world and know that they know better than we do. They have enormous amounts of capital on their side; Morozov has (arguably) whatever income he makes from his books. Do you not see how Zuckerberg, Lessig, O’Reilly, Shirky, McGonigal and many others are getting rich beyond belief–and making their clients even richer, depending on the individual–based on the snake oil they sell to a largely-unwitting public, and that this is a kind of deep, structural contempt far beyond whatever you think is rudeness? And that this profit motive exceeds by a factor of thousands whatever book sales Morozov might garner for himself? And is wanting to sell books something it’s fair to criticize ANY author for? It’s inherently true of every author. If it were true, we could disqualify what every author writes, and no opinion would be credible. Two points of correction: 1) Morozov often engages with people at all levels on his Twitter feed, and often engages thoughtful questions very respectfully; 2) your assertion about the subject of The Net Delusion and the success of the Arab Spring are very much off-base. The point of The Net Delusion is that communications technologies are useful to oppressive regimes–it does *not* say they aren’t useful to others. “Arab Spring” is too vague a phrase to mean much here, but depending on how one understands it, the role of particular communications technologies in “it”–and even more troublesome, the question of what “it” is (for example, in Egypt, where Mubarek was cast out of office, only to bring in a regime potentially no less repressive)–are by no means settled in the research literature, and there is a lot of compelling research that casts the emphasis on communications technologies in these events as exactly the kind of commercialized huckersterism (“our cool Silicon Valley product Twitter saved your middle eastern country!”) that is incredibly worrisome. There is even some cogent work by “digital activists” that come to this conclusion. This guy is neither smart or fun. He actually lacks the intelectual capacity to weave whats happening into a larger concept because he is just doing the easy part, making fun people. Neither smart or fun.